Yahoo just announced that they’ve acquired Associated Content, a startup that produces lots and lots of freelancer-contributed content on the cheap. Yahoo announced today that they’ve agreed to acquire Associated Content. (AdAge reports that the price is “just over $100 million.) 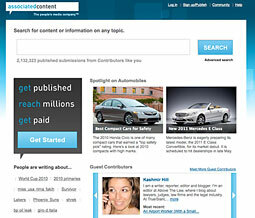 Associated Content is an online publisher (and, up until now, distributor) of content from hundreds of thousands of freelancing contributors. They’ll buy a writer’s content and publish it through their own network, which is pretty successful–they’ve got about 16 million unique readers per month, which is a very respectable number. To our contributors, this means a world of previously unimaginable growth opportunities. As our partnership evolves, a combined Yahoo! and Associated Content will deliver increased distribution (600 million unique visitors monthly, oh my! ), better performance, new tools and, more than anything, the opportunity to contribute your premium content to the web’s most powerful media company. It’s not clear how this will exactly affect Associated Content’s business–as AdAge points out, they’ve already got deals with publishers like Reuters and USA Today. But it’s smart on Yahoo’s part to buy such an inexpensive and near-endless source of content. Who’s next to dive into the measured consumer demand-driven content biz? Demand Media (eHow, Livestrong.com) is ripe for the plucking. Would News Corp’s Rupert Murdoch bet again on a company co-founded by former MySpace chairman Richard Rosenblatt? Google? Your predictions?